That led two years ago to the formation of Merchant’s Garden, an urban farming enterprise whose mission, according to the company website, is to “make fresh food accessible and affordable to everyone using the science of aquaponics and hydroponics.” The farm was started with the help of investors and the business accelerator organization Startup Tucson. It launched just as Shelton was finishing up his MBA. Shelton and his co-founders initially had trouble finding land for their urban farm, but they were eventually approached by the local school district, which had space available in a closed down school about 1½ miles from town. Merchant’s Garden now operates a 10,000-square-foot greenhouse; Shelton thinks of the founders as “agropreneurs,” who are creating technology today to feed people tomorrow. Utilizing an aquaponics system, Merchant’s Garden grows lettuce, various other leafy greens, basils, and a Mexican mint marigold (it’s an edible flower with pedals that are mint). The farm supplies products to about 20 area restaurants, an area food bank, and to the Tucson school district. Produce is selected and delivered within the same day, to ensure freshness. Starting Merchant’s Garden in Tucson versus another urban area had several advantages. “We have a robust knowledge capital with the University of Arizona, which is only a mile away from us,” Shelton says. 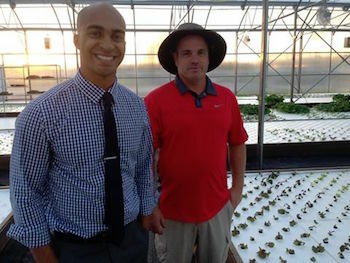 “They are a leading university for controlled environment agriculture and hydroponics and aquaponics.” With the state’s desert climate, the ability to grow produce year-round, as Merchant’s Garden is doing, appeals to many. The city of Tuscon was also named in 2015 a World City of Gastronomy by United Nations Educational, Scientific and Cultural Organization. “There’s been a lot of attention and buzz around food here,” he says. Eventually, the founders of Merchant’s Garden hope to expand their business concept of urban farming to cities around the nation, including through rooftop farming; they are in early talks to start another location in Phoenix. “We want better access to this kind of food than to McDonalds,” Shelton says. Shelton also would like to have the farm serve as a place where the public and customers can come and see how their food is grown and engage in the harvesting process. Shelton advises other sustainable farmers to get market data about their area, test new ideas, and learn from successes and failures. And while farming is not usually a cash cow, pun intended, he does recommend one green (as in money) tip: “Don’t be afraid of capital,” he says.